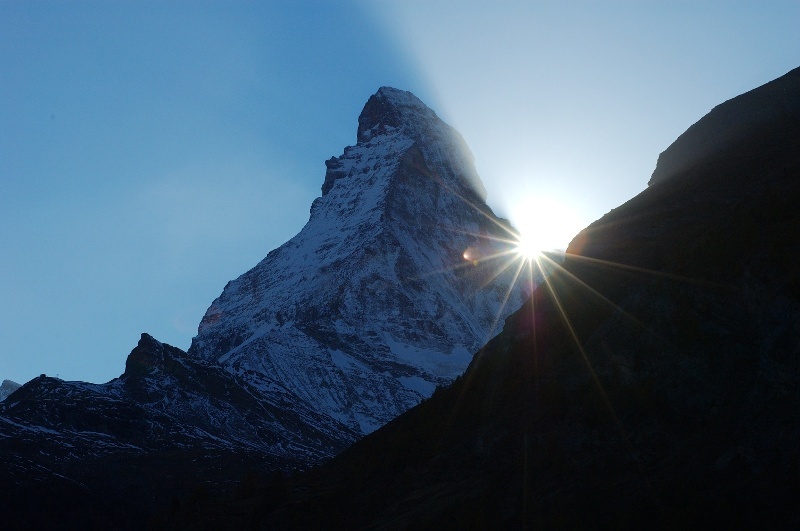 At 4,478 m, the Matterhorn is the most difficult classic in the Alps. 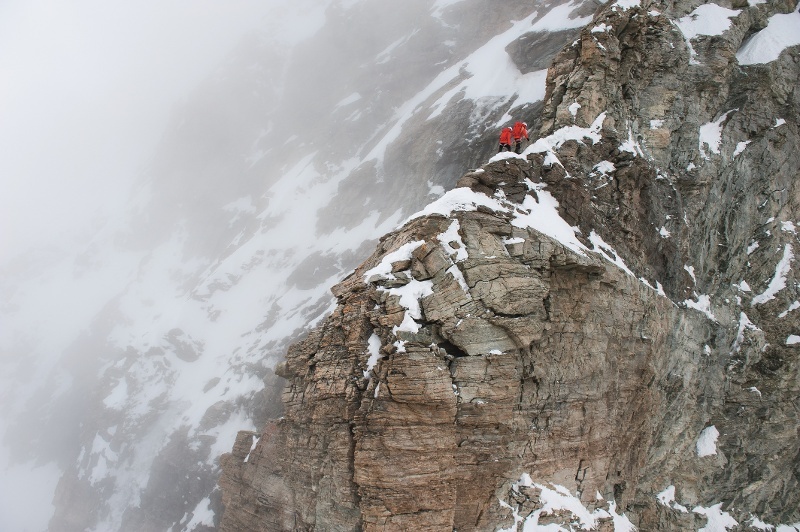 The climb and descent is done exclusively over rocks and ice, and it requires outstanding fitness and experience in rock climbing with and without crampons. The normal route is via the Hörnligrat and is only suitable for well-versed mountaineers accompanied by a mountain guide. On the day before the climb, one takes the cable car from Zermatt (1,620 m) to Schwarzsee (2,583 m). From there, one follows the hiking trail to the Hörnli Hut (3,260 m). The climb to the hut takes about two hours. One should not arrive too early, since the hut is only ready for occupancy after 3 pm. After dinner, a discussion of the schedule plan for the next day takes place and the equipment is controlled. And then it is time to go to sleep. Because the hut warden wakes climbers at 4 am, and after breakfast, it is time to put on the climbing harness, hiking boots and helmet. Climbers with mountain guides form a column and set off by foot first. In the dark, it is difficult to find the correct path; here, a mountain guide and a headlamp are necessary. It is very important to walk carefully on the loose gravel, because every misstep could start a rockslide for the following climbers. 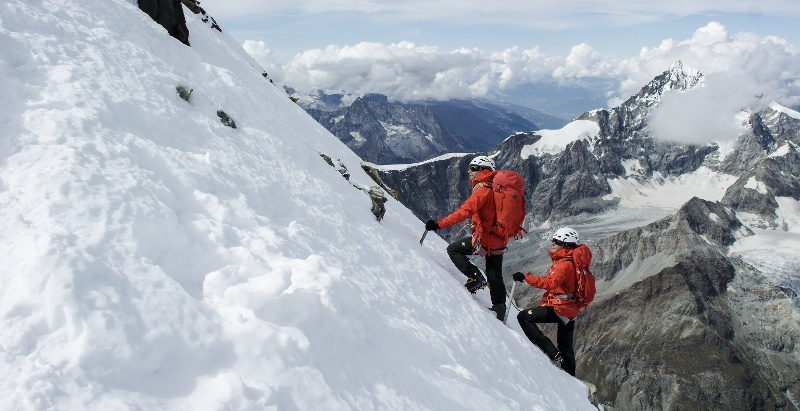 The enjoyment of climbing on the Hörnligrat is a real pleasure for the mountain guides if one is fit enough to do so. The experience at the summit is unforgettable. Once one is at the top, there is a breath-taking panorama in every direction: Mont Blanc, the Grande Paradiso of the Bernese Alps and below the Liongrat towards Italy, the steep north face and the Mattertal. The climbers, who made the first ascent already used this route to conquer the Matterhorn in 1865. The Hörnligrat is primarily gneiss, which means that the danger of sliding and falling rocks is great. 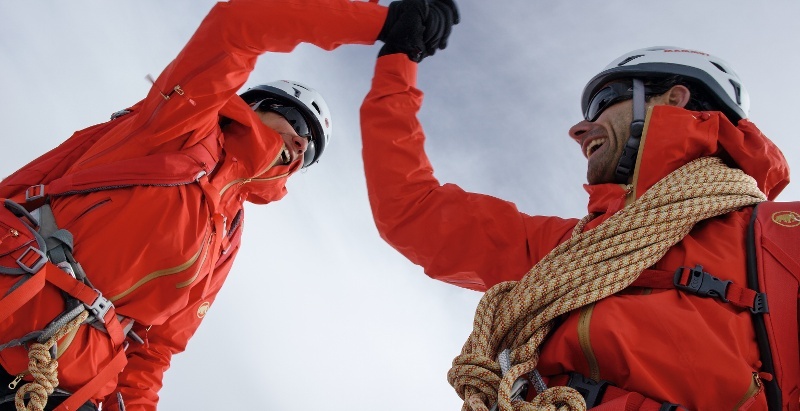 For this reason, it is important to engage a mountain guide for the climb. If one is just one metre off the route, one is already subject to falling rocks or can cause that. There are a few famous places that one passes on the way to the top: during the ascent past the protecting Madonna, at Grampiturm, yellow stripe, faules Eck (lazy corner), bite, lower and upper Moseley plate, Solvay Hut, shoulder, fixed rope, roof, Swiss summit (4,478 m), Italian summit (4,477 m) with metal peak cross. 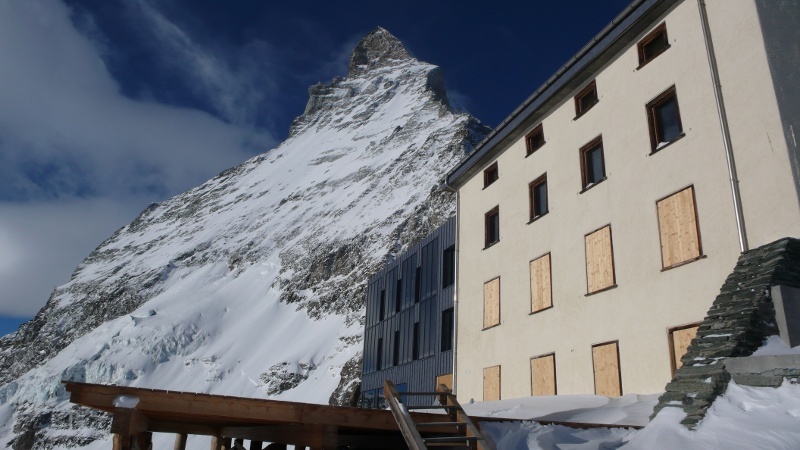 The Solvay Hut at 4,003 m) on the Hörnligrat was built in 1915, and is only a hut for shelter when climbers have an emergency. We strongly recommend that even experienced mountaineers book a qualified mountain guide who knows the mountain very well. Important! Requirements: 8 to 9 hour endurance performance. Having already a very good physical condition before the arrival in Zermatt. Experienced in rock climbing (grade IV) as well as in hiking and climbing with and without crampons, on both the ascent and descent. If you just want to experience what it is like to be on the Hörnligrat and then enjoy the view from the summit of the Matterhorn without having to climb the mountain yourself, you can do it with the “Mammut 360° Project”.